Increasingly recognized as synonymous with tropical grassy biomes, savannas are found in tropical and sub-tropical climates as well as warm, temperate regions of North America. Savanna Woody Plants and Large Herbivores examines the interactions between woody plants and browsing mammals in global savannas—focusing primarily on the C4 grassy ecosystems with woody components that constitute the majority of global savannas—and discusses contemporary savanna management models and applications. This much-needed addition to current research examines topics including the varying behavior of browsing mammals, the response to browsing by woody species, and the factors that inhibit forage intake. Contributions from an international team of active researchers and experts compare and contrast different savanna ecosystems, offering a global perspective on savanna functioning, the roles of soil and climate in resource availability and organism interaction, and the possible impacts of climate change across global savannas. 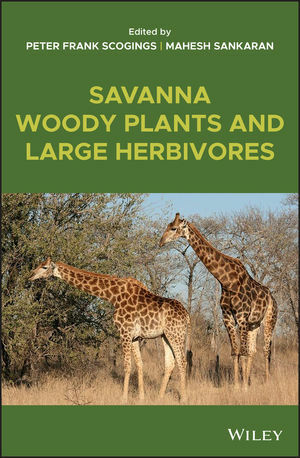 Savanna Woody Plants and Large Herbivores is a valuable addition to those in fields such as ecology, wildlife and conservation biology, natural resource management, and environmental science. Peter Frank Scogings is Associate Professor, School of Life Sciences, University of KwaZulu-Natal, South Africa. Mahesh Sankaran is Reader, National Centre for Biological Sciences, India, and Lecturer, Institute of Integrative & Comparative Biology, Faculty of Biological Sciences, University of Leeds, UK. 10. Predator Effects on Herbivore Dynamics and Behaviour: What Mechanisms Lead to Trophic Cascades in Savannas? 20. Savanna Ecosystem Models: What should a clever modeler code?